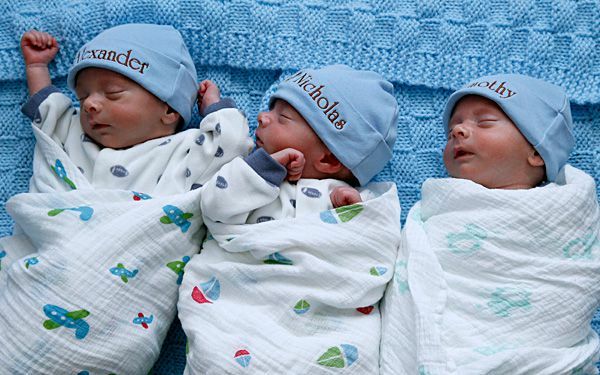 A suburban Detroit couple who have two older children are adjusting to life after becoming parents to identical triplets. It's a multiple birth that's rare. The Whiteley family of St. Clair Shores, Mich., celebrated the one-month birthdays for Alexander, Nicholas and Timothy. The brothers were born Jan. 25 at Henry Ford Hospital in Detroit. They spent nearly a month in the newborn intensive care unit. "I always wanted a big family so I guess this is the way to do it, get them all at once," Whiteley joked. Lauren Whiteley, 32, had an ultrasound at about eight or nine weeks to confirm the pregnancy. But she didn't know what she was seeing. AW triplets as know as three in the size of one. The two older brothers will adjust. I think they will like to help with there little brothers. I think they will help a lot and teach them. Now that they have more kids in there family their family is way bigger. There family is way bigger with 3 new babies in the house. But i'm happy that they have way more family now. Now that they have a bigger family its kind of better because they can be a big happy family. wow that is very amazing to have triplets I know someone who had triplets but anyways having three little newborns must be hard even if their all born on the same day because they are all gonna want the same attention as the other gets and trust me i know what it is like because my little sister screams and cries and she is like taking care of three little newborns but now my baby sister is 5 months old and she does not cry as much. The two older brothers need to adjust to the newborn baby's that there mom just has and they need too help out with the baby's so they can get use to them. I think that the older brother's needs to get used to a lot of their parents attention on the triplet's and not as much on them anymore. They also need to get used to a lot of crying. That would be too much work, I would think! Having triplets would be hard enough but already having two older kids on top of that! That's five kids! That is to many! I think that this is very cool because I am a triple and i have 2 brothers and I am a girl and we were all born on the same day. I think that the 2 brothers need to adjust to there's not just them in the house and they are going to have to get use to there's not just them any more three's 3 little babies in the house and there parents are going to have to take care of the baby not just them. and i think it will be easy to get use to i mean my brother Markus hes not a triplet but he got use to it and i have Charles and Stacey and Monica. they got use to it but then Charles Stacey and Monica did not live with use at the time but we did get to see them. It going to get easier to adjust to and when they get older it will be like you always had them in your life pretty much. I am just guessing i am not positive because my brother Markus he was the only child so that what i think.